There are a number of kettlebell exercises for the shoulders but shoulders can be very vulnerable so you have to be careful. The shoulder is a complicated joint, it needs to be both mobile but also stable when needed. It is because of the complexity of the shoulder joint that you need to ensure you exercise the shoulder correctly. First the shoulder should have its stability developed by conditioning the more endurance based muscles around the shoulder joint that maintain good shoulder alignment. Once the shoulder stability has been mastered then the larger prime mover muscles can be challenged. Failure to develop the shoulders in this order will continuously lead to shoulder / rotator cuff issues as the large prime mover muscles overpower the smaller stabilising muscles. OK, with that said let’s list out 10 of the best kettlebell exercises for the shoulders starting with the ones directed at stabilisation. Probably not the first exercise you expect when you think of kettlebell exercises for the shoulders but a very important one. 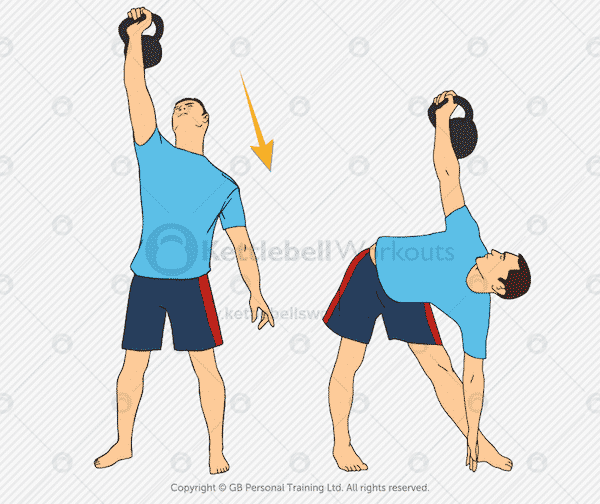 The kettlebell is helped up into the straight arm overhead position and then held there for up to 60 seconds. During the overhead hold the wrist and arm should be kept dead straight, the shoulder, back and down, in its socket and the ear kept away from the shoulder. The goal is to strengthen the stabilising muscles around the shoulder joint. 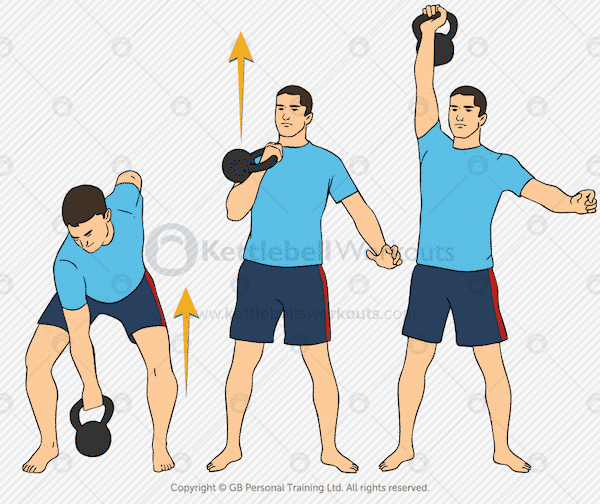 Once you can hold the kettlebell overhead for 60 seconds for both the overhead kneeling to standing and also while walking then you can progress onto the next exercise. Next you work into the shoulder joint even deeper by adding move movement and rotation through the joint. The kettlebell is held overhead as before with a straight arm and wrist and then you reach down towards the floor with the opposite hand. The ultimate goals is to reach the opposite ankle with the hand while keeping both legs straight. However, for the beginner achieving this full position can be very challenging both on the shoulder as well as the flexibility through the back and hamstrings. The exercise should be performed slowly and under control. Keep your eye on the kettlebell when descending. Your goal is 5 beautifully controlled windmills on each side. Perhaps one of the most important of all the kettlebell exercises along with the swing is the turkish get up. The get up conditions the whole body from top to toe working hard into the core muscle but also challenges the stability of the shoulder. 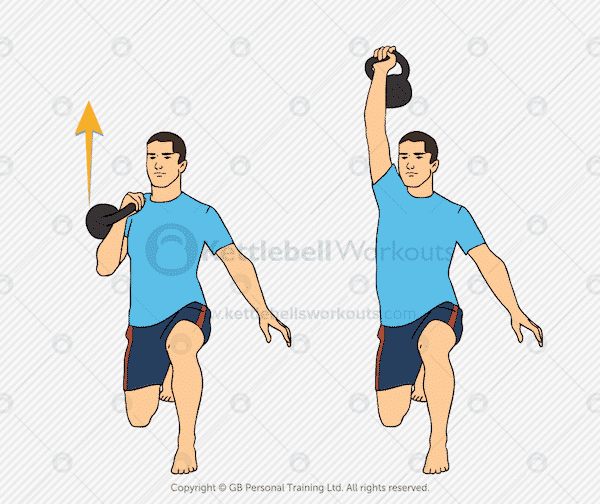 The kettlebell is held with a straight arm and wrist as the participant stands up from a lying down position and then returns back down to the floor. During the complete movement of the turkish get up the shoulder is forced to stabilise the joint through various angles. The ultimate goal is to perform 3 full Turkish Get Ups on each side without bending the arm. Once you can happily complete the exercises above then your shoulder stabilising muscles will be able to handle any overhead pressing safely. Pressing overhead is easier than holding so many people will avoid these holding exercises but that would be a big mistake. The ability to hold overhead will certainly help prevent future shoulder injuries in the future. A halfway progression between strict shoulder pressing overhead and holding is the Push Press. I recommend all beginners start with the push press before moving on to the strict overhead press later. The kettlebell push press involves using the legs and hips slightly just to get the kettlebell out of the sticking point when it’s held in the racked position at the chest. Once the kettlebell has been bumped up to the top position the descent is very important. 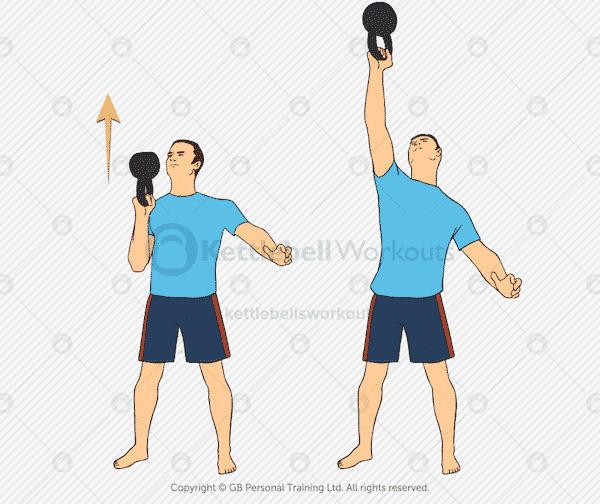 Control the kettlebell down very slowly actively using your latissimus dorsi muscles (under your armpit) as a kind of shelf to help guide the kettlebell down again. The goal here is to perform 8 – 12 repetitions on each side for a total of 3 sets. The kettlebell thruster takes the push press and makes it even more dynamic by exaggerating the push part of the movement. The kettlebell squat and press is a full body exercise that not only works the shoulders but heavily challenges the legs, buttocks, hamstrings, abs, back stabilisers and cardio. The demands on the shoulders are similar to the push press in that the sticking point from the racked position is avoided due to the momentum coming out of the bottom of the squat position. You will also find the shoulders fatigue just holding and maintaining the kettlebell throughout the exercise. Sets of 10 repetitions on each side are exhausting. Our next kettlebell exercise challenges the shoulders as well as the core muscles and the flexibility of the hips and hamstrings. 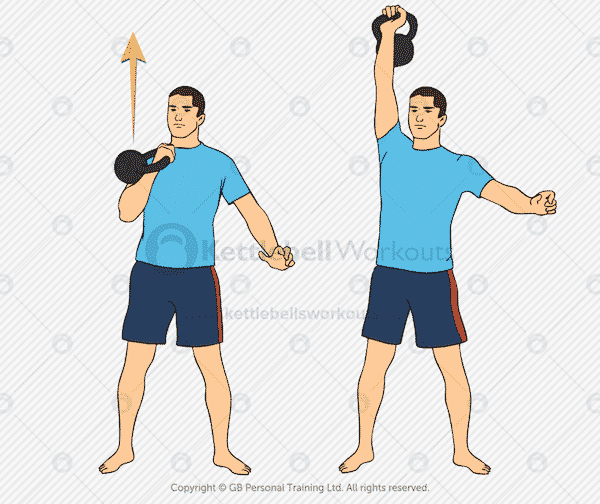 The exercise starts from the floor with the kettlebell held by the body with the thumbs around the handle. The legs are kept as straight as possible as the participant sits up and pushes the kettlebell with two hands overhead. The chest should be kept nice and high at the top position and the kettlebell pushed up and back. 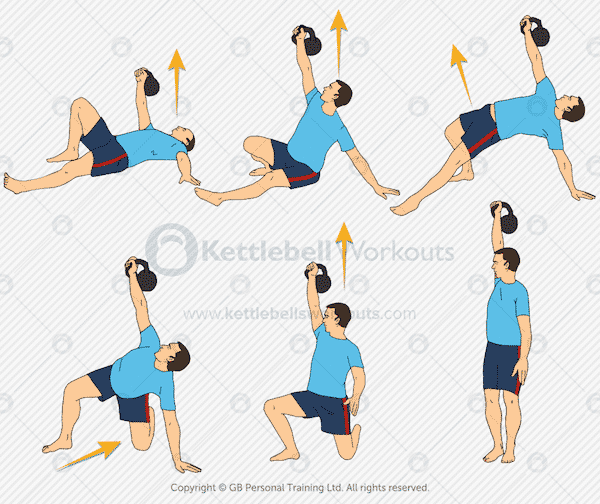 The second half of the exercise involve lowing the kettlebell and upper body back down to the floor as slowly as possible using the core muscles to resist the movement. 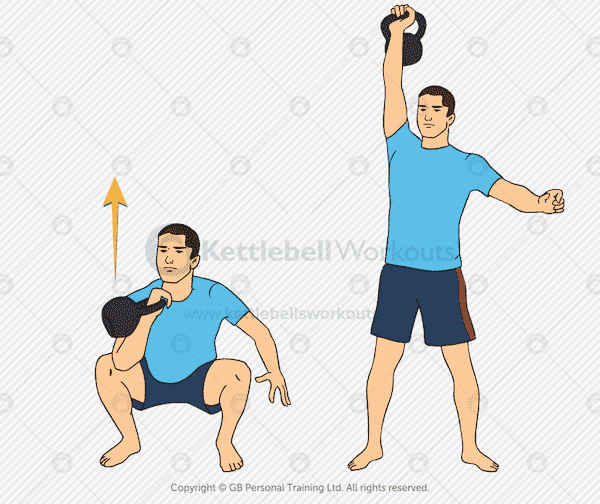 The kettlebell sit and press is an excellent strict shoulder exercise because the participant cannot use the legs or hips to help with the movement. 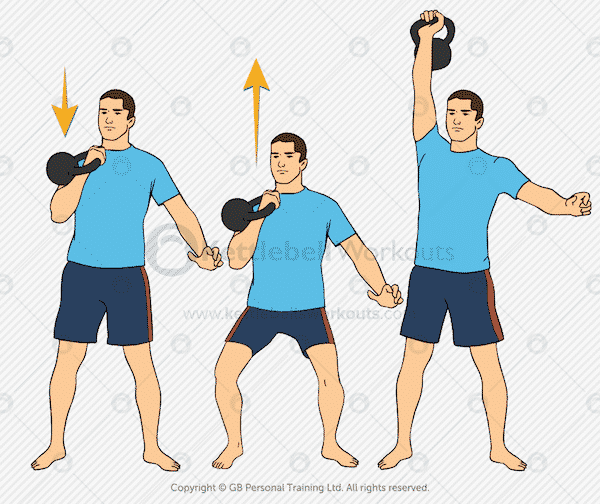 A great exercise for beginners because two hands are used on the kettlebell making the lift much easier. However, the sit and press exercise can be made more difficult by fatiguing the shoulders first with other exercises before using this one as a finisher. Next onto a huge full body exercise that strongly develops the shoulders too. The kettlebell clean exercise brings the kettlebell to the racked position on the chest. From the racked position the kettlebell can either be push pressed, as mentioned above, or pressed overhead with straight legs. The kettlebell clean and press can be easier on the shoulders because you can grab periods of rest in between each shoulder repetition as the kettlebell is returned back down to the floor. It is very important to master the clean exercise before any pressing based exercises so if you haven’t mastered the clean then do that first. 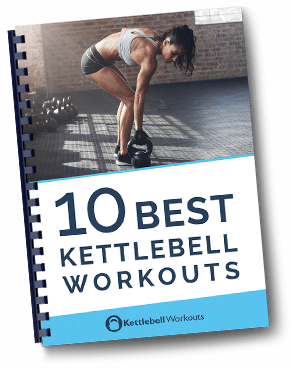 Sets of 10 – 12 repetitions of the kettlebell clean and press on each side is a great goal to begin with. My advice is to start with the kettlebell clean and push press before moving onto the strict overhead press. 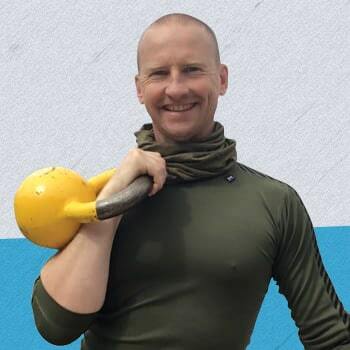 Now we move onto the kettlebell exercise that everybody seems to start with but as you can see it is far from a beginners exercise on this list. The kettlebell overhead press when performed correctly is highly effective. However, it does put huge demands on the shoulder stabilisers and should they not be conditioned as shown above injury is very possible. When performing the kettlebell overhead press the full body should be activated and tight including the buttocks, legs, core, grip and even the opposite hand should be squeezed tight. 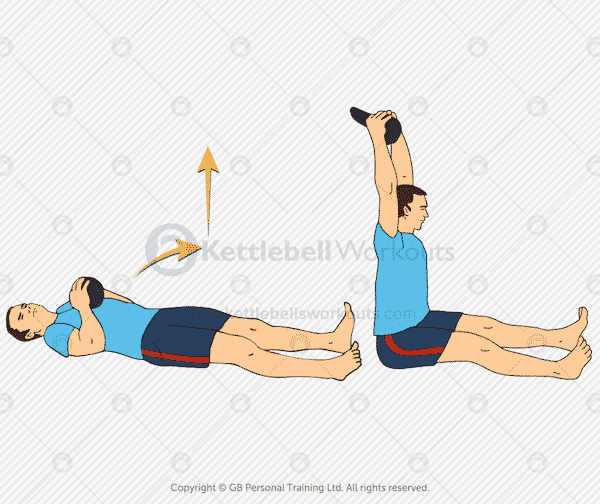 As with the push press the kettlebell should be lowered down slowly under control with the latissimus dorsi muscles, under the armpit, tightly activated. If you have mastered the strict kettlebell overhead press then the next progression is the kettlebell half kneeling press. Pressing the kettlebell from the half kneeling position with one knee on the floor eliminates any possibility of using the lower half of the body for the lift. You will also get some great core and hip activation with this variety of the press. I also like the half kneeling press because it highlights asymmetries between each side of the body. In other words, if you are weak on your right hip and left shoulder (core sling across the body) then you will quickly find this out. It is very important during this kettlebell exercises that you maintain a nice tall position with the glute squeezed tight and abs activated. It is all too common to sink or fold when lifting in this way as you start to fatigue. Set of 5 – 8 repetitions can be performed starting with the weaker side and then being matched by the stronger side. Finally the most challenging of all the kettlebell exercises for the shoulders. The kettlebell bottoms up press involves pressing the kettlebell overhead while in the upside down position. In order to preform repetitions of this exercise the participant needs to have excellent pressing ability and good alignment throughout the body. The kettlebell exercise demands excellent shoulder stability in order to control the awkward top heavy position of the kettlebell. When performing this demanding exercise the participant needs to be careful that the kettlebell doesn’t flop over and hit them in the face. Always be ready to move or drop the kettlebell if necessary. In order to master the bottoms up press the bottoms up clean should first be practiced. A good goal to begin with is the bottoms up clean, followed by the press and then return the kettlebell to the bottom position. 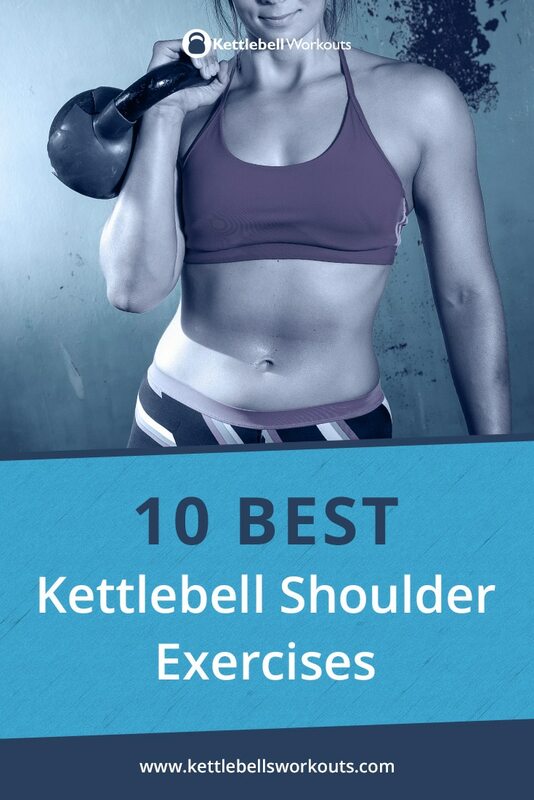 Above I have listed 10 kettlebell exercises for the shoulders starting with the important holding exercises and then finishing with the most challenging. When kettlebell training you should always work from the ground up meaning that exercises including: deadlifts, swings, cleans, and squats, should be mastered before overhead exercises. Due to the huge instability of the shoulder joint, overhead exercises should not be rushed or advanced too quickly. Start with the holding exercises as shown above and then slowly progress onto the more dynamic and challenging ones as your shoulder stability muscles strengthen. Best of luck and enjoy working on those shoulders. Yes I love the jerk press too Gary. I’ll be writing an updated article on pressing very soon.